At Last ! 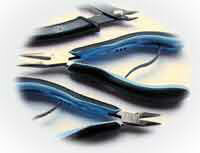 A page to quickly and easily find beginner jewelry making tools. I receive many emails from readers asking where to get beginner tools. These beginner-quality tools from Amazon will get you started. As you get more and more addicted to jewelry-making (and you will!) you can buy better quality tools from a jeweler's supply. Always buy the best quality tools you can afford. When I started fooling around with wire and beads I bought the cheapies. You really do get what you pay for. I'm a little on the frugal side (to put it nicely) and I hate spending money if I think I can something similar for less money. Don't be like me. I've spent so much money replacing cheap pliers and cutters with other cheap pliers and cutters. With all of that money I could buy some great pliers many times over. If you're made of money, buy the most expensive jewelry tools you can get. For the rest of us, go ahead and buy the cheapies. They are more difficult to work with, but as a beginner you don't want to spend a lot unless you're sure you'll be using them a lot. Once you are sure you love it, buy new tools when the old cheapies need replacing.